The newest addition to our campus, the Outdoor Classroom. A truly collaborative effort between local builders, the Sustainable Futures Program, the Goucher-Mount Holyoke Program and the Living Routes Program, along with staff and volunteers has meant a unique and beautiful classroom space. Serving as the focal point to a larger garden project, the classroom will be available to all members of the Monteverde Institute community. It has been designed to be multi-functional and can transform from an traditional academic space to a yoga/meditation studio, an outdoor lab, or a simple, peaceful refuge from the rain. 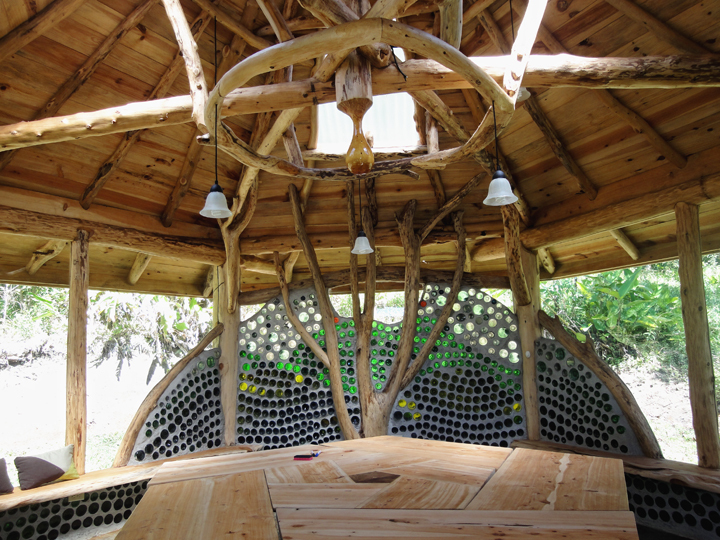 The construction has showcased artisanal building techniques combined with alternative materials, including non-native woods harvested from MVI land and recycled glass bottles from the community. We invite everyone to come and see it! Or visit us on Facebook for even more great pictures through the different phases of the project.